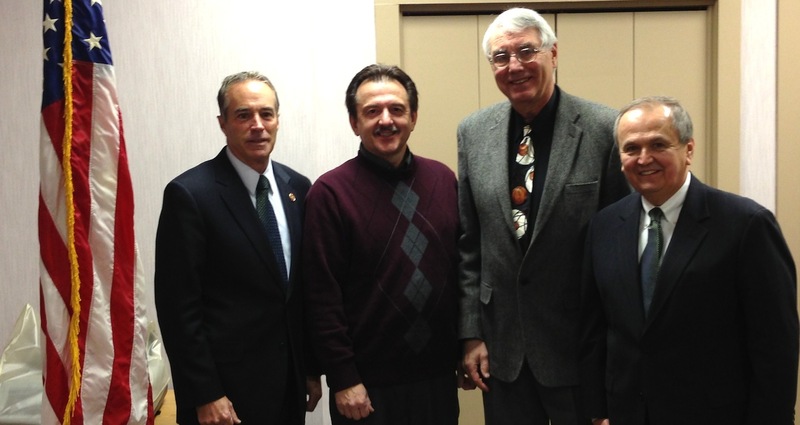 L-R: Congressman Chris Collins with Delphi retirees John Benoit and Rick Strusienski, and New York State Sen. George Maziarz. Congressman Chris Collins, NY-27, has joined the auto industry pension task force for the 113th Congress. Made up of members of the House of Representatives from both political parties, the group works to bring attention to the issues related to the termination of Delphi salaried retiree pensions. "Delphi salaried retirees were stripped of the benefits they worked for and were promised," Collins said. "This task force will work in a bipartisan way to help advocate for these retirees and try to find a solution that restores the salaried pensions without impacting federal taxpayers." Collins met with John Benoit and Rick Strusienski, both Delphi salaried retirees, to discuss the situation in Niagara County. The task force was founded last month and is chaired by congressmen Turner and Ryan, both of Ohio. WASHINGTON D.C. – Tue 2013-04-09, U.S. Senator Sherrod Brown (D-OH) announced that the Department of the Treasury has agreed to meet with the Delphi Salaried Retirees Association (DSRA). This announcement comes on the heels of Brown’s efforts to push the Obama Administration to meet with the Delphi salaried retirees and to pursue efforts that would restore the retirees’ pensions and benefits. As DSRA uncovers more evidence proving that the government illegally terminated our pension plan even as the government continues its cover-up of the facts, key Members of Congress are maintaining their efforts that help our cause. Some cannot be revealed, but one visible way is new, bipartisan legislation to make the federal government more open to taxpayers. HR 1211 was introduced on March 15 by Chair of the House Oversight and Government Reform Committee Darryl Issa (R-CA) and co-sponsored right away by the committee's Ranking Democrat Elijah Cummings (D-MD). The bill already has passed this key committee by voice vote on March 20 -- with an important amendment introduced by Rep. Michael Turner (R-OH) that gets at the heart of our issue. DSRA is very much appreciative of these efforts.